Crime has a new enemy, and justice has a brand new face. Fans of visionary director Sam Raimi (The Spider-Man trilogy) know well the story of Dr. Peyton Westlake and his tragic transformation into the action hero known as Darkman. Based on Raimi’s short story “The Darkman,” the popular crime-fighting master of disguises comes to life in the 1990 film adaptation Darkman, starring three-time Golden Globe nominee Liam Neeson (Taken) and Oscar winner Frances McDormand (Fargo). Directed by Sam Raimi, this explosive, action-packed thriller also stars Colin Friels (Dark City), Larry Drake (Dr. Giggles), Dan Hicks (Evil Dead 2) and Nicholas Worth (Swamp Thing) and features soundtrack by award-wining composer Danny Elfman. On February 18, 2014, Scream Factory will release Darkman: Collector's Edition Blu-ray, featuring all-new interviews with Liam Neeson, Frances McDormand, Larry Drake, Danny Hicks, make-up effects artist Tony Gardner, production designer Randy Ser, art director Philip Dagort and much more! When director Sam Raimi wanted to make a superhero movie he tried to get the rights to make a movie about The Shadow and Batman but wasn't able to so he decided to create his own - Darkman. The film was a moderate success that went on to become a cult classic but it was also a good launchpad for Sami Raimi, Liam Neeson, and Frances McDormand. Of course Raimi would later get another chance to direct a superhero movie when he went on to direct the Spiderman movies. 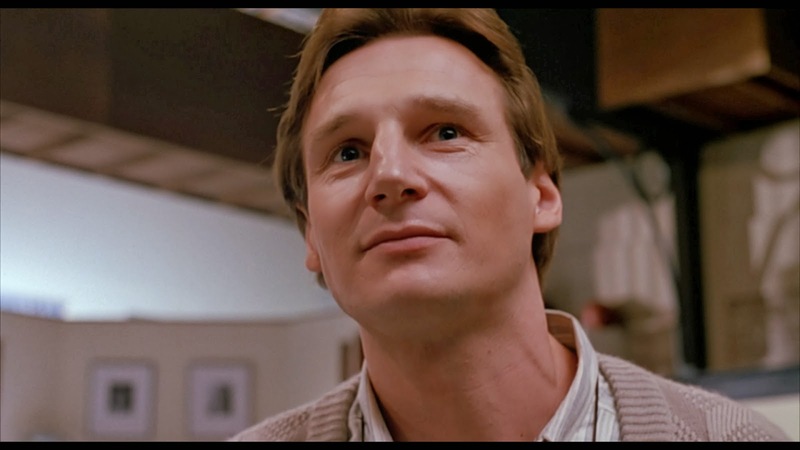 This was an early starring role for Liam Neeson who beat out Gary Oldman and Bill Paxton for the role when the studio didn't think that frequent Raimi collaborator Bruce Campbell could carry the movie. Darkman is a mix of different genres and a homage to many of the influences that he grew up with like the Universal monster movies and The Shadow. Its mix of horror, action, and dark comedy are standard fixtures in all of Raimi's movies. His visual style is is unmistakable and even in this early movie of his career it's easy to see his little touches throughout the movie. 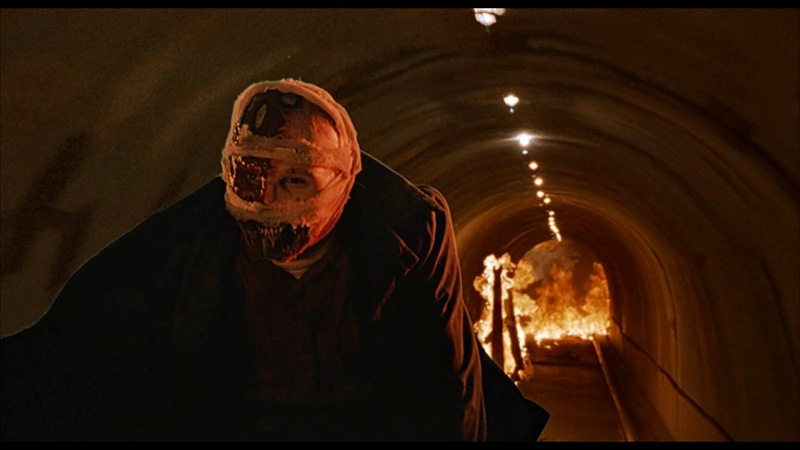 For Darkman, Raimi created a tragic hero much like the Phantom of the Opera who does what he does for a love that can never be requited after his accident. 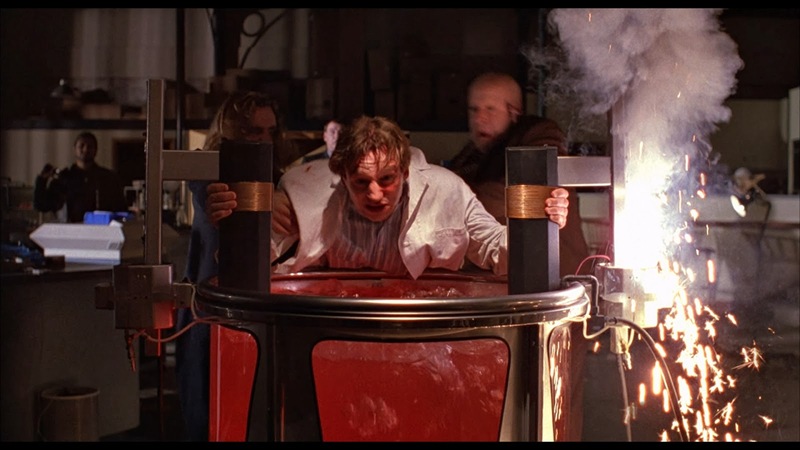 For poor Dr. Peyton Westlake (Liam Neeson), he is attacked in his lab by Robert Durant (Larry Drake) and his henchmen who have been sent to collect a memorandum that would implicate their boss developer Louis Strack (Colin Friels). Peyton's girlfriend Julie Hastings (France McDormand) had been investigating Strack and was the one who had the memo that brought Durant to the lab where Peyton had been working on creating synthetic skin to help burn victims. Little did he know that he would soon have need of it himself as Durant orders his men to blow up the lab with Peyton in it. Having survived the explosion but now horribly disfigured, Peyton;s injuries have damaged him so much that his brain no longer processes pain and he has heightened strength but he's also prone to stronger emotions like rage. Determined to get vengeance for what was done to him, Peyton starts to stalk Durant's men to pick them off one at a time, either by surprise or by guile as he starts to create masks of the henchmen (and later Durant himself) to infiltrate the gang to exterminate them. In his spare time, he's also created a mask of himself that he uses to reconnect with Julie who had thought he was dead. The only problem Peyton faces is the fact that his masks can't survive in daylight for more than a hundred minutes so he is always racing against time before it melts away and reveals his disfigurement. But in the darkness, the masks hold together and that's when he is at his best. It all comes to a head when Julie finally connects the dots and realizes who is controlling Durant and she is taken hostage which forces Peyton to take even more drastic measures to try to save her. I've always liked Darkman for a variety of reasons including the dark humor, the action, the Sam Raimi touches, and the performances. You really can't go wrong with having Liam Neeson in your starring role and he's great in this movie and really sells the tortured soul that's trapped in a monster's body. Frances McDormand is also fine in her role and Larry Drake is very believable as the evil Durant. Even though this was a relatively low budget film, it looks like every dollar they had was put on screen. The film does have its share of plot holes but they are easy to overlook because the movie is so much fun. 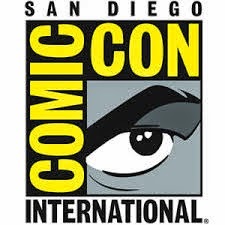 I wish this had become a real franchise and not just a direct to video one, as it had a lot of potential and it would have been interesting to see where it could have gone with a hero that could appear as anyone. This is a fun popcorn movie that fits in nicely with the rest of Sam Raimi's films. Shout Factory's release of Darkman looks better than the earlier releases I've seen. This 1080p (1.85:1) transfer looks pretty good for a catalog release. Detail is above average and looks even better during closeups and the colors look very good and distinct. The black levels are dark but not completely pitch back but it's much better than the DVD version. There are still some scratches and defects here and there but this transfer looks decent overall but I'm not sure how it compare with the earlier Blu-ray release from Universal since I don't own that one. Darkman's DTS-HD Master Audio 5.1 mix is much better than the accompanying DTS-HD Master Audio 2.0 track but it's nice that they have included both on this set. Dialogue is clear and clean sounding and the effects come across loud and clear, especially the various explosions that take place wherever Darkman happens to be living. Even though this is primarily a front channel centric mix, there were some nice moments that took advantage of the surround sound well. I also really enjoyed hearing how much better Danny Elfman's fantastic score sounds in this new mix. There's a lot of great extras here with a bunch of new ones combined with the earlier special features from previous releases. All of them are worth checking out! Audio Commentary – Director of Photographer Bill Pope shares some anecdotes about making the film and also lets us know how some of the effects were done. This man is a legend (just look him up and see what films he's worked on) and it's great to hear from him. I just wish the cast and Sam Raimi had participated. Interview with Liam Neeson - I had heard that there would be a new interview with Liam Neeson but when it wasn't listed on the Blu-ray I thought it must have fallen through until I put the disc in and saw it there. It's great that Neeson agreed to come back to provide a short interview about the film but he still had fond feelings about it and Sam Raimi. He talks about getting the role when he didn't think he had a chance since he was competing against Gary Oldman and Bill Paxton. He also shares how hard it was to make the movie and that he wouldn't do it if it was offered to him now because he believes he's too old to have the patience for the daily makeup. He also has a lot of praise for Raimi, McDormand, and Drake. Neeson also shares a funny story about how Raimi tricked him to be filmed fifty feet in the air when he knew that Neeson was afraid of heights. 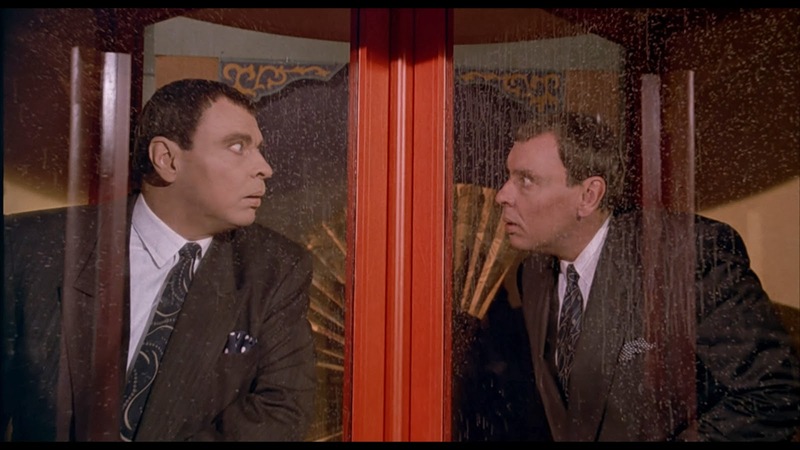 The Name is Durant with Larry Drake - Larry Drake also shares his thoughts on the movie and how he's always typecast as big and dumb or big and scary, or he's a big truck driver. He seemed to like playing the role of Durant although he hesitated about taking the part because he was afraid his role might contribute to little kids cutting fingers off like he does in the movie. Drake also talks about playing two versions of himself when Darkman disguises himself as Durant. He also mentions that he prefers the second movie more because he has a bigger role in it but still laments that he was blown up twice (not that that stopped Raimi from talking about bringing back Durant from the dead a third time). The Face of Revenge - A talk with make-up artist Tony Gardner who lets us know about how the cool makeup effects were accomplished for the movie. Henchman Tales - We hear from two of Durant's main henchmen as Dan Bell and Danny Hicks are interviewed separately about the movie and their roles and their characters' deaths. Dark Design - We hear from production designer Randy Ser and art director Philip Dagort who talk about creating the look of the movie and how much they loved working on it. Interview with Frances McDormand - A short interview with the actress who talks about making the film and how she didn't want to be the customary damsel in distress. Darkman Featurette - This is a vintage featurette that contains a bunch of on-set interviews with the cast and crew. Cast and Crew Interviews - Here's some more vintage interviews of the cast and crew and some of this footage was also included in the vintage featurette too. Vintage Interview Gallery - Here's more interviews with: Colin Friels, Frances McDormand, Liam Neeson, and Sam Raimi. These interviews are more in depth than the new ones so make sure you check these out. Darkman is a fun film that contains many of Sam Raimi's trademark touches and sense of humor. It has horror, action, and a lot of dark comedy and the cast who are all willing and able to go along for the ride. This collector's edition Blu-ray from Shout Factory offers some pretty good video and audio quality and the extras are very good too. If you are a fan of this movie, then you should pick this one up right away!